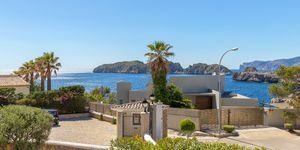 This beautiful semi-detached house is located in a coveted complex in Nova Santa Ponsa in the first sea line. The house has many terrace areas and a private pool. The beautiful location also offers a sea view and fantastic sunsets over the Malgrats islands. On the ground floor there are living-dining area, separate fitted kitchen with utility room and access to the garage, as well as a guest toilet. 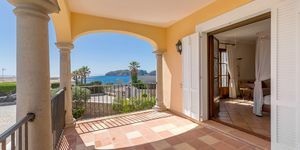 On the upper floor there are 3 bedrooms, all with a view to the sea. The master bedroom has an en suite bathroom and a terrace. 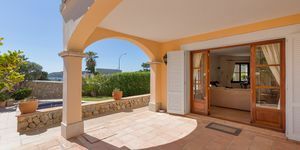 The house is located in a complex and the beautiful sun terrace with community pool can be used. You are interested in this property? Request a showing for this property, without commitment. 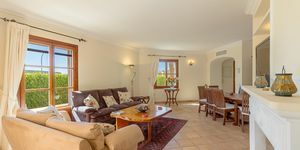 I agree that First Class Estate Mallorca S.L. will use the information I provide on this form to be in touch with me and to provide updates and marketing via Email. My information will be treated with respect. 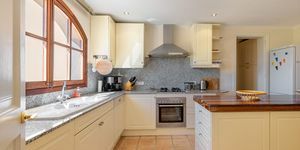 By clicking below, I agree that First Class Estate Mallorca S.L. may process my information in accordance with these terms. 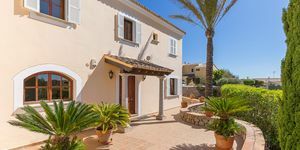 Similar Mallorca properties you might find interesting.